Zucchini is one of the most versatile (and tasty) vegetables in the Italian kitchen. In Episode 18 we shared with you Zucchini Italiani, and in Episode 19, we continue with this wonderful vegetable and share with you another way to prepare it– stuffed. Stuffed zucchini makes a great appetizer or a side dish. Stuffed zucchini, hot and ready to serve! 1-2 large zucchini, remove the seeds. The zucchini needs to be large enough for you to stuff, so find the biggest one you can. Homegrown or farm stands are usually the best place to find such large beasts. 1 small zucchini, peeled and diced. 2-3 celery stalks, diced. Dice up some of the stalk leaves as well. 1 clove of garlic, diced. 1 1/2 cups of seasoned breadcrumbs. See Episode 1 for how to prepare the breadcrumbs. Start off by slicing the zucchini length-wise and cleaning out the seeds. Cut out some excess zucchini to create a hollow center in the zucchini in which you can place the stuffing. Dice up the pieces of excess zucchini you used to hollow the center, or if you don’t have enough, peel and dice up a small zucchini. Place about 3-4 spoonfuls of the diced up zucchini into the hollowed center. Place the zucchini halves on a flat, oven-safe pan and set aside. Heat 2 spoonfuls of olive oil on the stove in a large frying pan. While the oil is heating, place the diced garlic in a bowl with the diced onion, then place the onions and garlic in the frying pan. Mix the diced celery into the pan as well. Stir and saute until tender. When finished, place in a bowl and set aside. Heat some more olive oil in the pan. When heated, place the potatoes into the pan. Saute until soft. When finished, mix the garlic, onion and celery mixture int the potatoes. Stir them together. When mixed together thoroughly, add the seasoned breadcrumbs and stir. Next, add in the pignoli nuts, dice olives and shredde provolone cheese. Mix together thoroughly over a medium heat on the stove. You want to make sure the mixture is moist, so add some more olive oil if it’s too dry. Spoon the stuffing into the hollowed out zucchinis. Stuff them all the way to the top, feeling free to overstuff them a bit if you’d like! 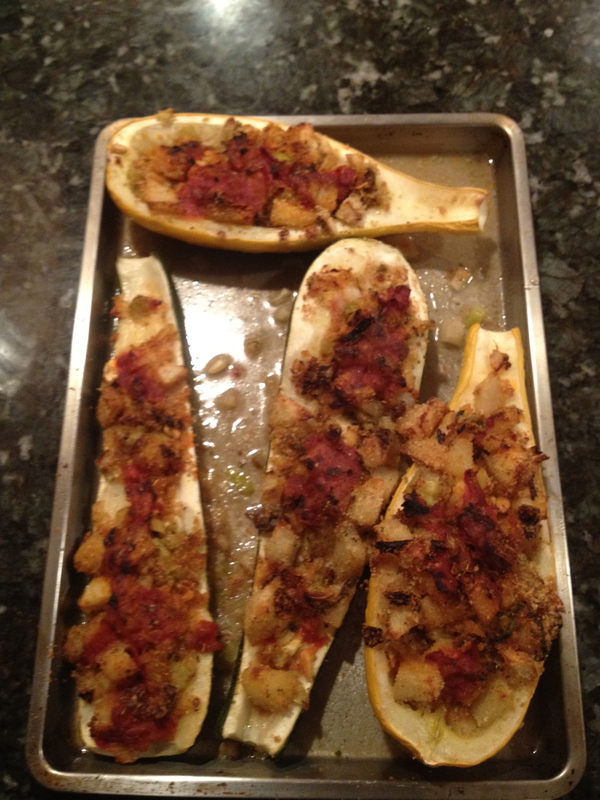 When done stuffing, spoon tomato sauce over the top of the stuffed zucchini. Sprinkle oregano over the top. Drizzle a little bit of olive oil on top as well. Add about 1 cup of water to the bottom of the pan before placing into the oven. This is necessary to assist in cooking the zucchini all the way through, including on the bottom. Place the pan into the oven and let bake for about 15-20 minutes. You’ll know it’s done when the zucchini is tender all the way through and the stuffing is browned on top. Serve while hot. I typically serve it as an appetizer or a side dish, slicing it into generous portions. Buon appetito! This entry was posted in Appetizers (antipasti), Side Dishes and tagged zucchini. Bookmark the permalink.